Have you ever had a bad biking day? I remember during the summer holidays, riding my old mountain bike at the McKenzie River Trail in Oregon. Everything started just fine and I covered my first four miles in breathtaking speed. When I was descending along the mountain river, the worst happened. My mountain bike broke into two. The front and the rear separated. All the fun that I had planned ended abruptly. I realized my bike had a very poor quality frame made from cheap bike material. Made of aluminum, the full suspension frame of the Mongoose Impasse Dual Full Suspension Bicycle is steady and tough. It has been precisely engineered to give the user maximum comfort and biking performance. Although the solid aluminum frame is a bit heavier than beginner mountain bikes in the market, you are sure of optimum control and a very responsive ride in all conditions. Whether you are a casual rider or a trailer, this mountain bike gives you the best full suspension. This is made possible by the combined frame and suspension. The aluminum material is durable and will offer you a service for many years. This mountain bike has all the suspension bases covered with a dual full suspension mountain bike system. For improved control and smoother bumps, this mountain bike has been fitted with an element suspension shock. The rear elements shocks have no hydraulic dampening or pneumatic. They will comfortably handle any off-road runs. The spring pre-load of the suspension can be adjusted by tightening or loosening, for your own personal preference or terrain. When you are riding in those dirt roads, rural roads, and gravel-lined trails, the suspension will work very well in smoothing out those potholes. New users may find the full dual suspension quite stiff. However, after a few hours on the road, the fork will ease out. This will give you that smooth ride. This mountain bike has been designed to give you a full responsive and safe biking experience. 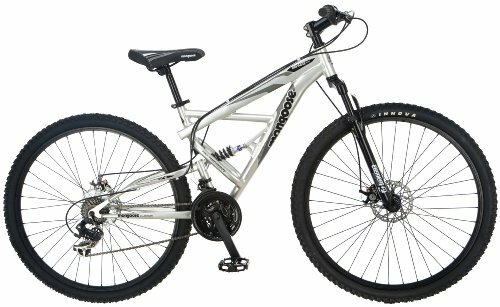 The Mongoose Impasse Dual Full Suspension Bicycle comes with reliable disc brakes both front and back. You are sure to stop any time you apply the brakes even during those emergency moments. You will be riding with confidence with this effective braking system. With such great braking power, you will not slide out of control or end up slamming into objects. The brake system is highly efficient in all types of weather conditions and different terrains including downhill inclines and muddy tracks. The sifter system of the Mongoose Impasse Dual Full Suspension Bicycle is a 21-speed TX-35 rear derailleur from Shimano, MTB front derailleur and on top of that, it also comes with SRAM MRX twist shifters. That system has been perfectly combined together to let you switch and shift gears easily for the best convenience in riding. The wheelset of this mountain bike is 29 inches. The rims of the wheels are made of alloy while the hubs are made from alloy discs. For adjustments and stress-free replacements, the headset has been made to be oversized and threadless. The receptive alloy bike pedals and the durable Suntour crank put this bike among the best. These wheels give you maximum traction and wide surface contact when you are riding. The quick release front function makes storing and transporting the bike quick and simple. The Mongoose Impasse Dual Full Suspension Bicycle is a great bike for entry level. Due to its unique features, you will have a smooth and soft riding experience. The assembly process is fast and straightforward. To get the running right, spend a few hours to give it a complete tuning. This is a mountain bike worth investing in considering the best mountain bike value for your money. You will cover all trails and terrains with this solid bike from Mongoose. It is stylish, functional, and affordable bike for the outdoor fun.